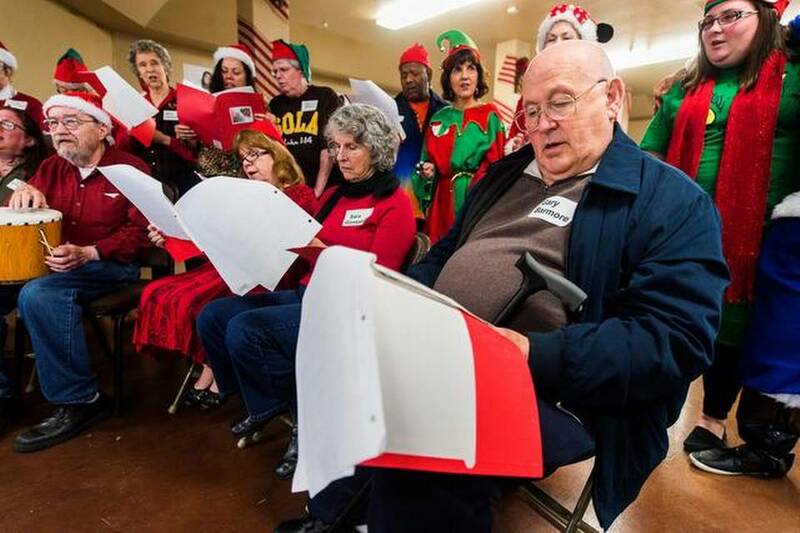 In honor of the holiday season, I wanted to share this article, profiling the Miracle Minstrels, a choral group in the Sacramento area comprised largely of stroke survivors with aphasia. In the majority of people, language function is largely housed in the left hemisphere of the brain. A stroke or brain injury involving injury to these centers or pathways on the left side can result in language impairment. This is known as aphasia. Sometimes symptoms may be consistent with motor aphasia, also known as Broca’s aphasia, in which expressed language impairment exists while potentially sparing interpreted language (understanding what others are saying or retaining the ability to read written language). Sensory aphasia, also known as Wernicke’s aphasia, occurs when interpreted language is impaired, although the person may still speak fluently. However, the speech may not make sense to others. More commonly, there is at least some component of both aphasia types present, even if one aphasia type is more noticeable than the other. A speech therapist in California, Renee Garner, and a stroke survivor, Barbara LaPlaca, started a choral group of aphasic brain injury survivors as a way to provide social engagement and to continue rehabilitation beyond speech therapy sessions. The brain’s musicality section, where musical familiarity, recognition, and production is generated, is housed in the right side of the brain. These creative individuals utilize music as a way of bypassing language impairment to allow patients to share their voices. Among the countless ways the brain has amazed me during my time as a neurologist is witnessing the musicality that may be present in patients who are otherwise unable to speak. During my residency training, a hospitalized woman who remained completely silent for a week after a large left-brain stroke suddenly sprung to verbal life as a small group of us entered her room one morning, singing “Happy Birthday to You.” Overwhelmed by the familiarity of this tune (Do any of us actually remember the first time we heard this song? ), she joined us for the fourth and final line. We then continued to sing the song a second time, not wanting the experience to cease, and she was able to vocalize some of the words as long as they were part of a song. There is a memorable scene in Corrie ten Boom’s memoir, The Hiding Place, in which her mother, left severely aphasic after a stroke, suddenly starts to sing her favorite hymn when it is played at a wedding. Corrie sees this event as miraculous. Regardless of an individual’s religious beliefs, it is difficult not to experience awe and to marvel at the organization and processing capabilities within the human brain. It is fascinating. My figurative hat is off to the Miracle Minstrels, for stepping outside of a comfort zone to perform in front of audiences after brain injuries have left them struggling with language, as well as to the founders for their clever idea and motivation to start such a group.